A scorcher of a day brought some sizzling rugby action to Netherdale on Sunday for the first of the 10-event series AM.PM Event Catering Kings of the Sevens rounds. 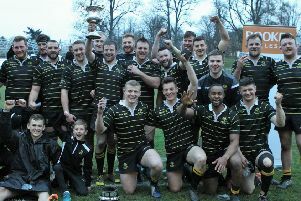 The hosts took the first honours of the season with victory over Jed-Forest in a highly entertaining final at the Five Star Taxis Gala Sevens, which was blessed with spring sunshine from start to finish. All day long the two sides had looked by far the strongest teams on show and both dominated their pool sections. It was the hosts, however, who provided the winning edge in the final with two late tries from Ruairi Howarth proving the decisive factor. Gala captain George Graham was delighted with the performance of his team and paid tribute to the large Netherdale crowd who voiced their support throughout the day. “They were fantastic, not just for us, but for all the teams present and that really kept us going in the final,” he told The Southern. The Maroons made it through to the semi-finals with wins over Kelso (40-0) and Peebles (40-7) before putting Selkirk to the sword (40-17) in their penultimate game. The tournament saw a return to action for Gala speedster Craig Robertson, who was top try scorer on the day after coming back from a serious shoulder injury. “I feel better than I ever have,” he told us. “Since having an operation a few months ago I have thrown myself into recovery and fitness work, and I felt the benefits today. Jed’s run to the finals was equally smooth. Melrose (27-14) and Watsonians (24-0) were the victims in the pool stage, with Boroughmuir (34-14) being the prey in the semi-finals. The hosts got off on the wrong foot in the final when Robertson was sin-binned for a deliberate knock-on in the second minute, but Jed failed to capitalise during the two-minute period that Gala were down to six men. The Riverside outfit did eventually get their first points on the board when Lewis Young strode over the Gala line, but the hosts struck straight back with a try from Grayson Hart, converted by David O’Hagan. With the scores all level at seven points each at the break, the second half promised some excitement and proceeded to deliver. Gregor Young was first to have the crowd cheering when running the length of the pitch to score, with brother Lewis converting from the touchline before Chris Auld ran in at the posts and O’Hagan again levelling the scores. Michael Weekley was next in for Jed, but once again Gala responded immediately with Howarth going in for the try. O’Hagan’s conversion put the hosts ahead for the first time in the match and two minutes later the large support erupted into a cacophony of sound as O’Hagan converted a second Howarth try right on full time to take the first sevens title of the series. Melrose won the Plate competion, while Watsonians bagged the Bowl. Gala: A. Emond, G. Graham, F. Hunter, G. Hart, R. Howarth, C. Auld, J. Parker, G. Young, C. Robertson and D. O’Hagan. Jed-Forest: D. Gillespie, D. Grieve, S. Ainslie, M. Weekley, L. Young, G. Young, R. Shirra-Gibb, C. Gillon, F. Harkness and M. Mitchell.